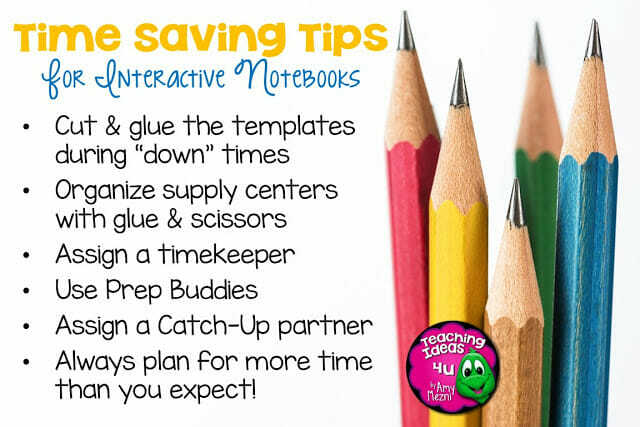 If you are like me, when you first heard of interactive notebooks you probably thought, “Who has time for kids to cut and glue all the time?” However, there are a few simple strategies that teachers can use to help save time when using interactive notebooks. If you are brand new to interactive notebooks, estimate how much time you think it will take your class to cut and glue. Now double that number. Budget that amount of time in your class. Never fear, it won’t always take that long. However, at first, until you establish a rhythm of how you will do the prep work in your class – and figure out who has poor small motor skills – it is going to take a while. Okay, now don’t panic. It really doesn’t take as long to prep as you think it does. If I had my copies made, I could cut and glue two sets of the templates in under 5 minutes. (I had a separate book for each class.) If I needed the answer key, I would (try to) print that ahead of time, but I didn’t fill in my notebook until we work as a class. Having my notebook prepped gave me an example to show the students. 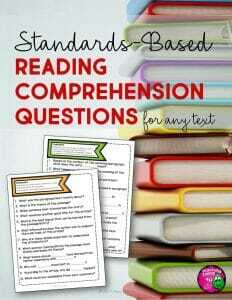 This helps cut down on the “I don’t understand how to glue it” comments, because the students could look at it. I will admit that it takes some trial and error to figure out a supply center set-up that works for each person, but it is worth it. If you have to pass out glue and scissors every time you want to do INBs, that eats up a lot of time. However, if you have students that absolutely mess with the supplies, you may need to move the supplies to a counter. The one issue I had with supply areas at tables was students taking supplies from another tables buckets. I recommend labeling each bucket’s supplies with a different color of washi tape. That makes it a lot easier to tell if supplies were not put back correctly. Seriously, this is one of the easiest ideas that kids just absolutely love. If you haven’t already heard this tip, buy cheap clocks as soon as you can – I recommend 2 – and assign your two most off-task students to be your timekeepers. (All of the students want to be timekeeper – everyone wants that clock!) I found neon green clocks at a big box store and students always wanted to be the timekeeper. It is really helpful to ask students who are done cutting and gluing to help a table buddy that isn’t finished. I was absolutely amazed at how many kids struggled to cut a line. A number of my students didn’t have glue or scissors in their homes. Add that to less time for arts and crafts at school and you end up with students in the upper grades without well-developed fine motor skills. What do you do when a student is absent? Try to get another student to cut the template for them. (I found it helpful to ask a student to do this rather to the assign partners ahead of time. You know who can cut quickly!) 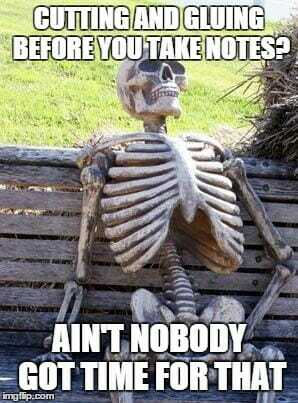 If the student can find the absent student’s notebook, then have them glue the pieces in. Otherwise, store them in a baggie. When the students returns, they are ready to copy down the information. 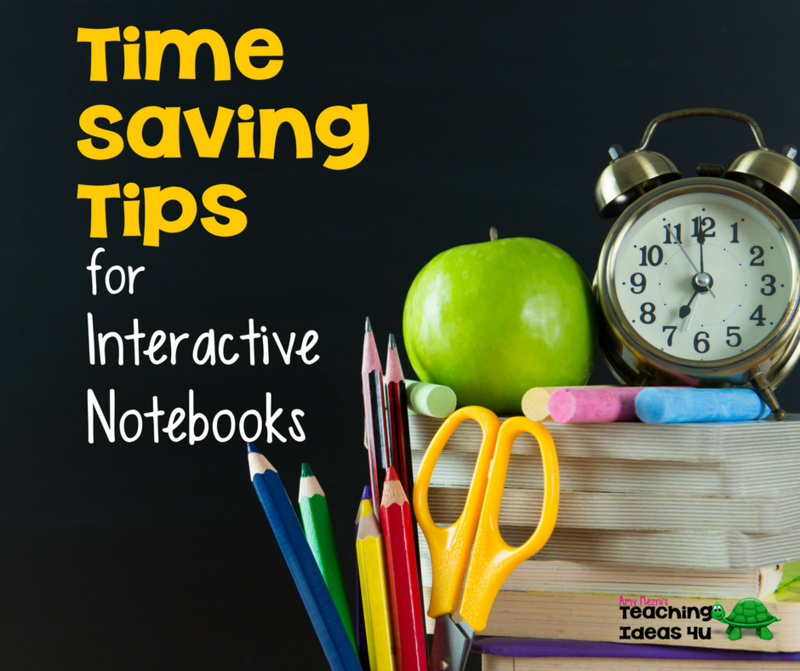 What are your time saving tips for using interactive notebooks?